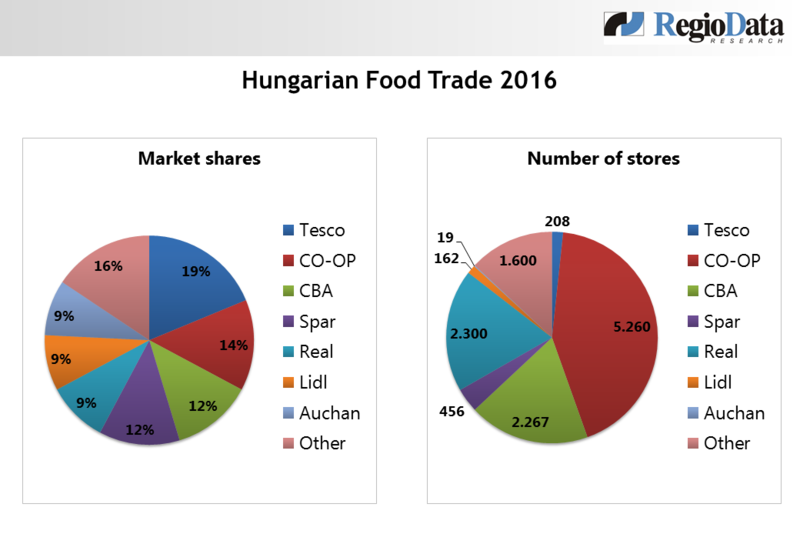 Since 2008, net sales in the Hungarian food trade have already dropped from around € 11 billion to € 9 billion. In addition to that, the VAT increased from 25% up to 27% and plenty of other taxes for (foreign) companies were implemented. Besides the weak increase of the purchasing power of the population and various depreciation of the forint, the "old" food trade such as CBA and CO-OP has proven to be tougher than expected. Currently, the market concentration is already well-advanced and the largest share of turnover in this segment is generated by a handful of companies- and Hungarian companies are strongly involved. Until a few years ago, the less densely populated regions were dominated mainly by small and independent family companies. Meanwhile, the number of chain stores has significantly increased. As one of the first foreign companies in the Hungarian market, Tesco has successfully established itself as the market leader with € 2.4 billion turnover, followed by the domestic companies CO-OP Hungary and CBA. The Austrian company “Spar” with a total of 424 stores and 32 “Interspar” stores follows closely behind, although its commitment causes increasing (€)losses each year. In general, a slight increase in food sales is expected again in the coming years. Since the EU Commission declared the increased EU food safety fee of 6% (declared in the beginning of 2015) to be unlawful, far-sighted business management for foreign investors became easier again.